Bought my first Kong Wild Knots toy at a store, but found much cheaper prices here. Same toy exactly, better price here. Rope inside means that when dog chews through the toy, there is something to keep her interest and keep chewing. Rope inside is a good chew, even when toy is destroyed. Prices here are best I found. A friend bought Winston and Lucy a red bird one for Christmas and they absolutely loved it! So when Sierra came to temporarily stay she loved it too and wouldn't let the other two play with it. So I went looking for more so they could all have one. They love them all and can play tug of war with them and chomp away on them. Winston and Lucy are small and while they can destroy toys they never destroyed red bird. However, Sierra is a big puppy that loves to eat everything and she has managed to get a wing chewed along with the knotted rope so they are not big chewing puppy proof. Still, they were fairly inexpensive and the dogs love them so it's worth it! Our dogs love these toys. 1-800-petsupplies is my go to store since they have reasonable prices (less $$ than local stores), free shipping with qualified orders and fast, well packaged delivery. I like the rope inside. My dogs love tug of war and this toy is great for that because there is rope on the inside. 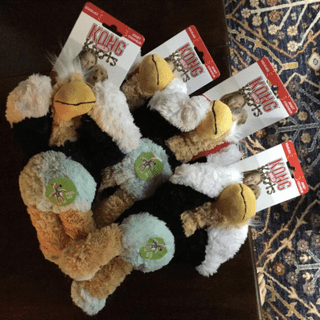 My dogs love these toys and because they are very durable I love them too! our rescue dogs absolutely love these toys:) one of these has lasted a week with daily use. Our dog loves to chew on the knot inside. Kong Knots are my Labrador's favorite toys. They hold up pretty well, and he continues to play with them even after he rips the stuffing out of the face. Because the inside is rope, there is still something to play with. Have bought two from local store in past. Dogs loved them. Price was much more reasonable through 1800PetSupplies. Good price, have had the small teddy bear that holds up for a week or so with my Maltipoo.